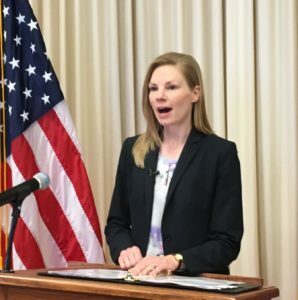 Missouri Auditor Nicole Galloway, D, has released a report saying the state’s budget is under mounting stress due to a shrinking tax base coupled with increasing expenses. She contends tax cuts sold by lawmakers as generators of economic growth aren’t fulfilling that promise. Galloway says Missouri’s recent pattern of tax reductions followed by cuts to state services reflects trouble being experienced on a larger scale in an adjacent state. Kansas passed large individual and small business tax cuts in 2012 and 2013 that never generated economic growth to offset the decreased revenues brought on by the tax cuts. As a result, Kansas lawmakers approved tax increases on items such as cigarettes, but ultimately repealed the original tax cuts last year. Galloway’s report concludes that no level of income tax rate reductions will result in a net increase in state revenues in Missouri. The analysis shows that tax cuts do trigger more economic activity, but as with Kansas, not enough to compensate for the resulting loss in revenues. Galloway contends numerous factors including a failure to monitor items such as the state’s legal expenses and tax credit liabilities have left the budget unstable and ill equipped to handle future economic downturns. The analysis also says an increased reliance on individual income tax revenue has made the budget more sensitive to economic downturns, and a lack of sufficient emergency reserve funds will not allow enough cushion to prevent drastic budget cuts during such a time. Because the state constitution limits the state’s reserve fund to 7.5% of general revenue collections, the fund is currently more than $300 million short of a balance suggested by a Moody Analytics report. Another constitutional restriction in Missouri is what is commonly referred to as the Hancock amendment. It requires voter approval before taxes or fees can be increased by the legislature beyond a certain annual limit, which in 2017 was $101.5 million. The Auditor’s analysis points out that the Hancock Amendment ties the hands of lawmakers because it does not allow them the flexibility to reverse cuts to revenue that may exceed expectations. Another finding of the analysis is that taxpayers are increasingly being called upon to foot the bill for government though higher local taxes and an increased share of the state budget. The state auditor, who was appointed to her position in 2015, says decisions have been made to benefit the few at the expense of citizens. “This is due to special interest giveaways, corporate giveaways and changes in policy over the last several years, meaning that government is basically balanced on the backs of working Missourians” Galloway said. The analysis shows that individual income taxes now supply 65% of the state’s general revenues versus 53% in 2003. The Auditor’s office teamed up with economists at the University of Central Missouri and the University of Missouri on the research, which showed that reliance on sales taxes and corporate taxes have decreased as the dependence on individual taxes has risen. Auditor Galloway is the only Democrat to hold a statewide office in the Missouri government. She’s up for reelection this year. Republican Governor Eric Greitens responded to Galloway’s report, during a briefing with reporters at the Governor’s Mansion. Greitens said Galloway’s math is wrong.